Come with an independent program which can adjust mileage directly. 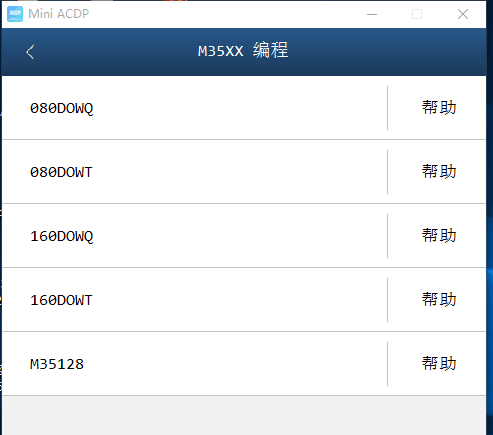 also can work with Yanhua Mini ACDP. Q: I have bought mini acdp with module 4, does this adapted erase the 35160WT chip guaranteed without red dot on dash ? A: Only with module 4 do not support to erase, you need to buy 35160/35080 Programming Emulator(SM58) together. pay attention to the chip direction. Add a new folder on your desktop, for example, named "mileage modification." and a USB flash drive with the name (35xxx memory) on the computer "has removable storage device" be added. Open the (35xxx memory) U disk, copy the compressed file "35xx mileage modification tool .rar" and paste to the desktop “mileage modification” folder, and then decompress it to the current folder to get the file "35xx mileage modification tool .exe". 5: Copy the original data to the "mileage modification" folder on the desktop . Open the “mileage modification” folder, drag the original data to the modification tool or double-click to open the “35XX mileage modification tool”, drag the original data into the tool interface and press Enter to confirm. Enter the mileage data you want to modify as prompted (Note: please enter unit after the value like XXXkm or XXXmi), then press Enter to confirm, and the new file 35xxx raw data _yyyy.bin will be automatically generated. Open the "35XX Memory" USB flash drive, delete the 35xxx simulated data .bin file of the corresponding chip (note the "simulated" data file), and then copy the 35xxx original data _yyyy.bin file generated in the "mileage modification" folder to the "35XX memory" U disk. Re-plug the simulator, open the "35XX memory" U disk, compare the newly-generated simulated data of the corresponding chip and the modified data in the "mileage modification" folder. If the data is the same, the operation is successful. Solder the simulator to the instrument chip location. Tip: The copied raw data.bin file is recommended to be saved to the computer, so that the data can be recovered when the operation is wrong. If the operation is abnormal, don't be nervous, unplug the usb and plug it back to restore normal.